Top 5 Power Outages in N.H. The late October storm that roared into New Hampshire with hurricane-force winds Sunday and Monday caused the fourth-largest power outage in state history. 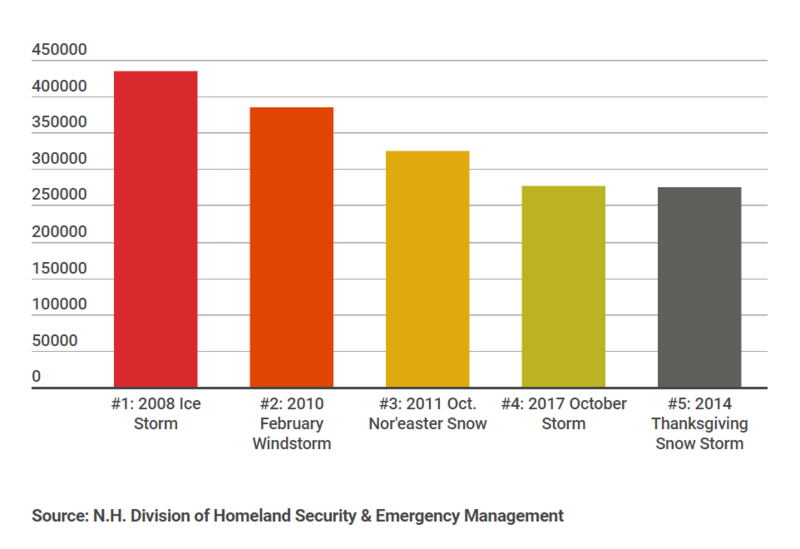 The top five outages all occurred in the past decade, according to the New Hampshire Division of Homeland Security and Emergency Management. The state reports that as many as 450,000 Granite Staters were without power at some point during the storm. A few thousand people are just having their electricity restored today. The charts below show estimated customers. Storm damage assessment is ongoing. The state is taking familiar steps in order to apply for federal emergency disaster funds. 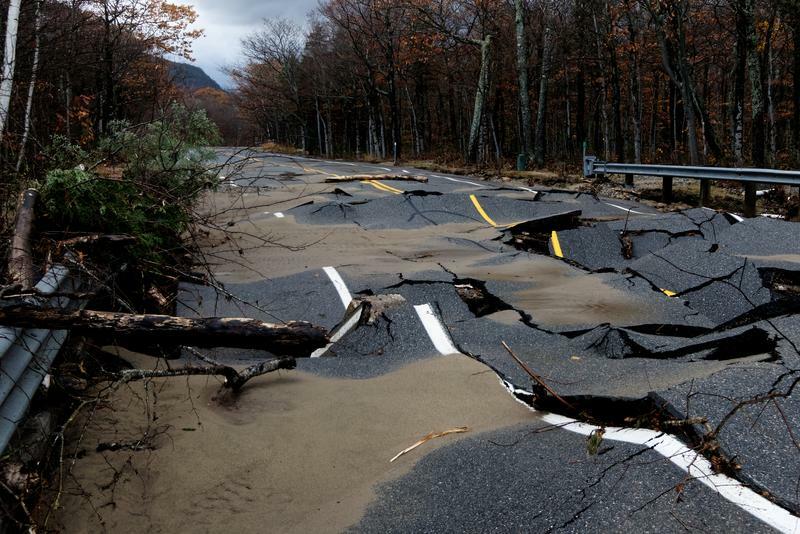 Homeland Security and Emergency Management Director Perry Plummer said that New Hampshire has already tallied up more than $8 million in damage. Hundreds of roads were closed due to erosion or flooding. No deaths or significant injuries were reported in the storm, Perry's office said Friday. FRIDAY update: There are fewer than 10,000 outages in New Hampshire, as of 11 a.m., as utility line- and tree- crews redoubled efforts on troublesome areas. The remaining outages showcase parts of the state that were particularly hit hard when high winds swept into the region overnight Sunday. Eversource, the state's largest utility, is down to 5,899, or 1 percent of its customers, without power. N.H. Electric Co-op is down to 3,978. Storm Damage: Swollen River Destroys House in Warren, N.H.
A video of a house floating down the Baker River in Warren put an exclamation point on the severity of the storm Monday. Thomas K. Babbit took the video. Wendy Babbit, his wife, said the Baker River is still overflowing in places. She described communities in that area of the state cut off due to swelling rivers and closed or washed-out roads. "It's just sad," she says. "There's a heck of a lot of damage up here." The Campton Elementary School provided shelter last night for 35 plus residents evacuated from the Six Flags Mobile Home Park and the Beebe River area. NHPR’s Sean Hurley went to the school this morning to talk to the evacuees about their experience.